The Irish Harp Orchestra is a new, young concert troupe of traditional Irish musicians featuring many current All Ireland Champions. Based at the heart of Ireland’s cultural capital in Limerick, the harp orchestra has a national membership comprising harpers from all over the country, along with uilleann pipes, highland (or Scottish) pipes, fiddles, flutes, whistles, concertinas, mandolins and bodhrana! The Harp Orchestra concerts are always spectacular presentations of Irish music song and dance and this Christmas Collection is no exception. We’re just sorry you can’t see us dancing on the CD! 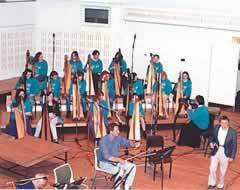 The idea of the Harp Orchestra evolved from the Grammy Award winning Belfast Harp Orchestra (1992-2002) which was created by founder-director Janet Harbison to celebrate the bicentenary of the Belfast Harper’s Festival, the single most important event in Ireland’s cultural history. 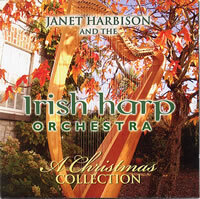 Janet Harbison was born in Dublin in the mid 1950s at a time of great renewal and interest in Irish music. Having spent some time as a child boarding at an Irish language college in Rinn, County Waterford, her passion for traditional music and song inspired her career choice which after winning all major national and a number of prestigious international harp competitions, involved traveling the world as a performing soloist for a number of years. In 1984, Janet turned her attention to the 18th century manuscript collection of harp music gathered at the Belfast Harpers’ Festival of 1792. 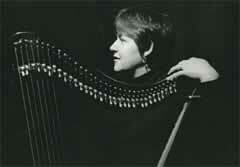 After two years as a Junior Research Fellow and a PhD student in Ethnomusicology at Queen’s University, Janet worked for eight years as Curator of Music for the Ulster Folk Museum, and for another eight years as CEO of the Harp Foundation, an organisation re-establishing the harp and working toward peace and reconciliation in Northern Irish life. The Harp Orchestras was part of this work. In 2002, Janet returned to her roots in the Republic of Ireland, where along with husband Malcolm Gullis, she established the Irish Harp Centre, a College for the study of Ireland’s national instrument (and emblem) and a Stage School for traditional Irish music. 1 BRIGHT NEW MORNING: An original piece composed by Janet celebrating peace in Northern Ireland in last 1994. The theme is ‘coming together’ or ‘symphony’: embracing the old and the new in style, classical and popular music in format, the jig and reel in rhythm — and of Northern Irish Protestant and Catholic in performance. The tune was also dedicated to the enormous work of American President Bill Clinton toward Peace in Northern Ireland. The orchestra were to perform it for him during his visit to Belfast in November 1995, but a quirk of fate dictated otherwise. Afterwards, however, we sent a recording of it to President Bill who sent a special letter to the orchestra declaring that he “loved it” and he was now a fervent fan! Thank-you Bill. 2 THE ENNISCORTHY CAROL: This is a carol introduced to Janet by her old friend Diarmuid 0 Muirithe who has published seminal research on the Wexford Carols. However, while this one is included in his collection, and is also published in Oxford as “The Wexford Carol”, it is not one of Luke Waddinge’s 17th century publication of "Pious and Godly Songs” but was in fact found on a broadside (published page with the text of a song) published in Enniscorthy most likely dating from the 19th century. The song itself, of course, could be a good deal older in origin. 3 DING DONG MERRILY ON HIGH: A modern 16th century French carol well known today. 4 BELFAST HORNPIPE: This well known hornpipe was arranged by Janet for flautist James Galway with the Belfast Harp Orchestra for BBC’s “Songs of Praise” in 1996. Here it is performed with our own fluter Martin. 5 ELEANOR PLUNKETT: This must be one of the favourite airs of Turlough O'Carolan (1670-1738) who composed it in honour of the tragic lady of the title whose family of 30 members were killed in a fire which ravaged her home in Castlecome Castle near Kells in County Meath. 6 IN THE BLEAK MIDWINTER: The text of this beautiful carol was composed by the famous poetess Christina Rossetti in 1872. It was set to music by the equally famous English composer Gustav Hoist in 1906. Holst is most famous for his orchestral suite The Planets. 7 GLASGOW POLICE PIPERS MARCH: A well known piper’s march associated with the Glasgow police, we guess! 9 REMEMBERING 1690 (The Boyne Water - Limerick’s Lament): This is a combination of two emotive tunes from Irish history. The tune of the Boyne Water has an origin of at least 80 years before 1690 when it is the melody of a tune praising King James the 1st. It was played by King William’s fifers as they marched into the Battle of the Boyne in 1689 where King James II and his hopes of wresting the crown of England from King William were thwarted. The war did not end here however as the battles continued at Aughrim and finally at Limerick in 1690. The Lament was composed by the harper Miles of Reilly of Killincarra of County Cavan in the wake of that final siege ending the hopes of easing English rule in Ireland. 11 PLANXTY IRWIN - FANNY POWER: These are two of O’Carolan’s best known tunes composed in the 1710s or 20s. They were dedicated to Colonel John Irwin of Tanrego House on Ballysodare Bay, County Sligo and Lady Frances Power of Coorheen in Loughrea, County Galway. 12 THE POLKA SET: These polkas originate from east Limerick, on the edge of the famous Sliabh Luachra region so famous for their polka dancing and composing. Their names are John Egan’s, Peg Ryan’s and the Murroe Polkas. 13 PORT NA BPUCAI: This beautiful and haunting slow air on the Uilleann Pipes is said to have been inspired by the ‘Pucai’ or mischievous spirits that sing in the night in the remote places of Ireland. 14 DE DO BHEATHA: This is an Irish carol that Janet has known from early childhood. She learned it at school in Colaiste na Rinne in Waterford in 1966 and here it is performed one verse in Irish and the others in Janet’s English text loosely translated from the Irish. 15 THE LARK IN MORNING & THE CLUMSY LOVER: A combination of a jig and a reel, uilleann and highland pipes. This tune is said to have been composed by an Uilleann piper after a long night’s session and a lot of ale — inspired by the dawn chorus of larks on his way home... The Clumsy Lover was not his wife’s response, rather a piping tune reputedly from Nova Scotia. 16 SILENT NIGHT: The German carol Stills Nacht is the universal Christmas song sung here in Irish and English as we know and love it well. Its significance as an anthem for peace at Christmas time makes it a special addition to any Christmas music collection. Harpers: Janet Harbison (and vocals); Annalee Foster (and vocals), Elmear Coughian (current under 12 yrs All Ireland Champion Harper, and whistle), Gerard Coughian (and whistle), Deirdre Murphy, Fiana O Connell, Aoife O Dowd. The All Ireland Championships are the title holders of the annual world-wide Irish traditional music competitions hosted by Comhaltas Ceoltoiri Eireann in which tens of thousands of young and adult people compete through county and regional heats to the national and world competitions for the prestigious title of All Ireland Champion. 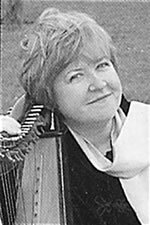 Born in Dublin on August 1st, 1955, Janet Harbison is acknowledged as one of Ireland's most prominent traditional harpers and pioneering personalities in the Irish harp music scene. She is an authoritative resource on the history and music of the Irish harp and ethnic music. Her discovery and enthusiasm for much of the extinct ancient harp repertoire led her into teaching and reviving the music through the oral tradition. For this activity, she has often been referred to as "Ireland's Crusading Harper" and many of today's rising professional performers and teachers are former students. To describe Janet as an influential teacher would be to tell only half of the story. She is also a prolific composer, a talented performer, writer and producer. She established the Harp Orchestras in order to provide her students with the opportunity to perform in public and to develop careers as professional harpers. As a composer she realized that there was little ‘new’ music being written for the Irish harp and set about correcting the imbalance. Her arrangements are widely used and harpers worldwide await her new publications with bated breath. With more than 20 years of performance, composition, teaching and promoting the tradition of harping she has a staggering number accolades to her name. 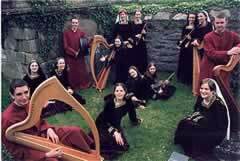 The Irish Harp Orchestra and The National Harp Orchestra. The Irish Harp Orchestra is a professional touring company while The National Harp Orchestra is a junior stage production company with membership from 11 years upward. The Irish Harp Orchestra grew out of the junior orchestra and featured on a Grammy Award winning album with the Chieftains. This is an internationally touring company which features up to 16 harpers and 8 other musicians, singers and a team of up to 32 dancers in large scales concert presentations. The National Harp Orchestra offers a unique opportunity for young and maturing people to mix in a cultural environment, to participate in large scale stage productions and gain valuable life experience, sharing in the great adventure of the orchestra on tour. Members receive training in stage craft, concert presentation, personal development, confidence building and leadership skills, TV work and recording. The original orchestra was found in 1992 as the Belfast Harp Orchestra to celebrate the Bicentenary year of the Belfast Harpers’ Assembly an historical event which original took place in 1772. 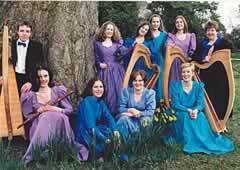 In 2004 we will establish the Irish American Harp orchestra in our continuing effort to offer all traditional harpers the opportunity to perform in public and to continue our work of promoting and celebrating the tradition of Irish Harping. Booking & Courses Please visit the Irish Harp Centre web site for full details of courses, stage school and bookings for Corporate Entertainment & Weddings.